I have a weird relationship with Mexico in Vancouver, and that has always been the case for the more than 10 years that I lived in Vancouver. I have set foot at the Mexican Consulate in Vancouver TWICE in my entire life. Don’t get me wrong, I love being Mexican, and with an increasing flow of Mexican folks to Vancouver, the number of events associated with showcasing Mexico and Mexican culture has increased as well. But I never really felt the need to be part of the Latino or Mexican community in Vancouver. I do, however, feel a duty as a Mexican who has a blog that is very popular in Canada, and in Vancouver particularly, to promote MexicoFest 2012 (although I’m a bit uneasy with the popularization of Mexican culture, as I often fear that we will soon have Can-Mex food, as we have Tex-Mex in the US). Nevertheless, I’m proud of my country and its culture, arts and people, so I do encourage you to participate in MexicoFest 2012. Mexico Fest began in 2008 as a celebration of the anniversary of Mexico’s Independence and has grown into the most important festival to be hosted by the Consulate of Mexico in British Columbia. Due to the growing interest the festival has attracted from the local community, MexicoFest has become an opportunity to feature some of our renowned tourist spots and a way to bring about a greater understanding of our country. This year’s focus will be on the beautiful Banderas Bay and the preferred tourist destinations of Western Canadians: Puerto Vallarta and Riviera Nayarit. 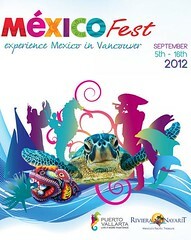 Mexico Fest 2012 encompasses 11days of art exhibit, music, culinary celebration, a gala dinner, a golf tournament and the 5th edition of the Fiesta Mexico Independencia. Given that I recently participated in a media trip sponsored by the Mexican Tourism Board, I foresee that I will be doing more promotional work of Mexico in Canada, so stay tuned. And do consider attending MexicoFest 2012. There will be A LOT of things to do. Check out the list of events for MexicoFest 2012 here. Hi – I am in Victoria and was planning to attend but came down with the flu. Did you go to the event today – how many people were there – was it fun! What was the best thing about the Fiesta – hope to hear from you soon!